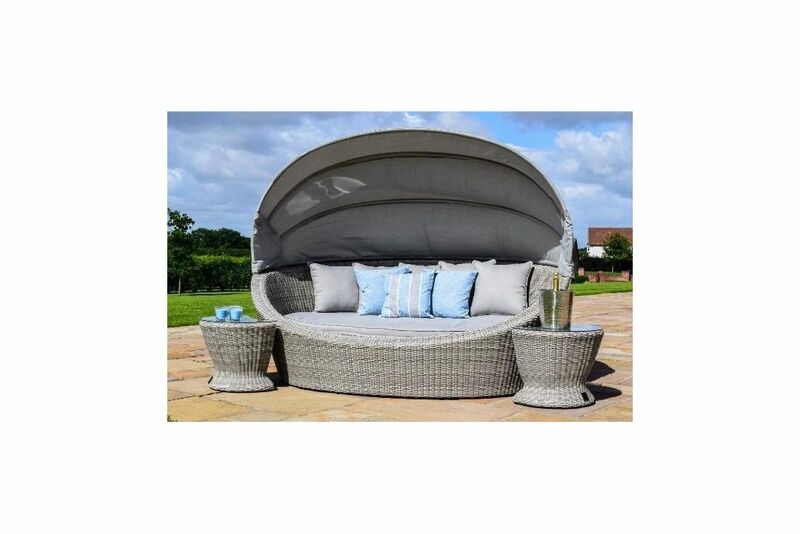 Complete with Side Tables the oval shaped daybed with hood to protect against the sunshine finished in on-trend grey rattan weave with matching thick grey cushions, this set has an appearance of wicker luxury & quality with its fine detailing which will only leave your friends or guests envious that you have one of these! All day you can relax and long into the evening with this Oxford Daybed Large grey base cushions and scatter cushions form a huge seating area with canopy finished in grey rattan, powder coated aluminium frame and with two side tables this a great value purchase for something different in your garden or outdoor space. Once you have removed the shower proof cushions, you can leave this set outside all year without a cover without any problems. They are also shower proof however will only withstand a shower, not a sustained heavy downpour.